Lionel Messi: "Wayne Rooney is a Once in a Generation Player"
Many tributes have flooded in for the Manchester United and England captain after the striker became England’s all-time leading goalscorer on Tuesday — he scored his 50th goal in 107 games for the Three Lions to surpass Sir Bobby Charlton’s long-standing record — but perhaps Messi’s glowing praise will stand out above them all. Messi, the captain of Argentina and a Barcelona legend who has been crowned the best player on the planet on four different occasions, had the following to say about Rooney. 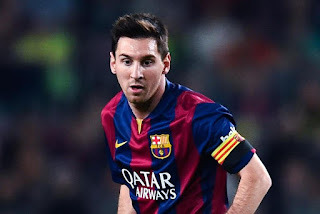 With Messi, 28, just a year younger than Rooney, we have barely seen their talents grace the same field over the years with only fleeting appearances against each other in the UEFA Champions League and on the international stage. However, if Messi rates Rooney so highly, does he deserve to be mentioned in the same breath as the Argentine magician, Cristiano Ronaldo, Neymar and Luis Suarez in terms of his greatness? In a few years time, despite all the doubts and off-the-field issues during his 13-year career to date, fans of England and United may well look back and realize they didn’t truly appreciate what they had with Rooney until he’s gone [Source : NBC Sport]..